This Documents Page is comprised of articles about Burroughs, her writings, and excerpts of her speeches. It is designed to complement and expand your knowledge and understanding of her. Everything included in this website is the result of the exhaustive work of many, many professional women. I have the highest regard and respect for them and again express my sincere appreciation for their efforts. I make reference to a few only because they were the primary sources for my work. First, I started in the Library of Congress, where Dr. Evelyn Brooks Higginbotham was a major source in organizing the 110,000 pieces of information. My first reading of an extensive work about Burroughs was the 2008 Doctoral Dissertation by Dr. Ann Michele Mason of the University of Maryland, Nannie H. Burroughs Rhetorical Leadership During the Inter-war Period. Most importantly, Dr. Bettye Collier-Thomas autographed my copy of her 2010 book, Jesus. Jobs and Justice. The essence of my work about Burroughs is best reflected in this comprehensive study of the roles played by Black church women in our society. 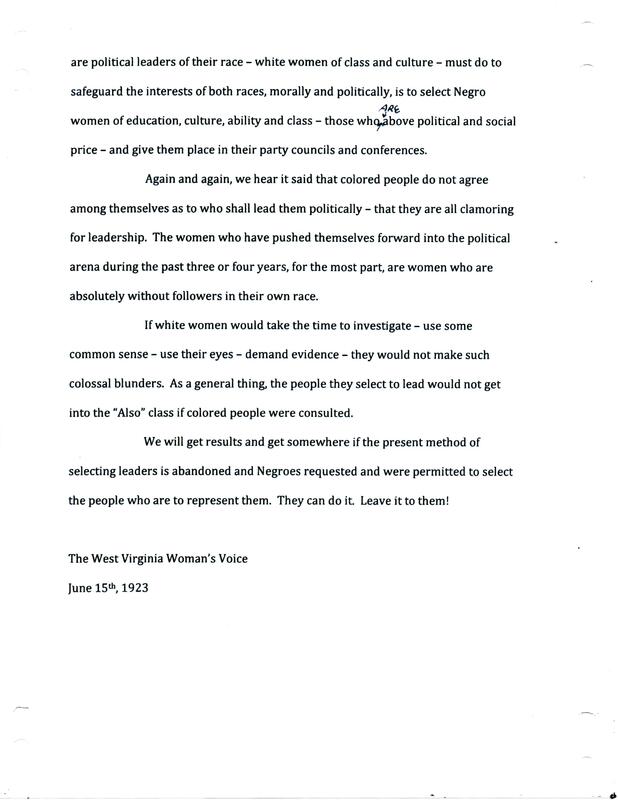 Finally, the Women's Missionary Union of the Southern Baptist Convention highlighted in a significant way the cooperation between Burroughs and her White sisters in fighting racism by sponsoring Dr. Sondra Washington in her writing the 2006 book, The Story of Nannie Helen Burroughs. I encourage you to Google the life of Nannie Helen Burroughs and find the many writings about this remarkable woman who has simply been lost to history. I have tried my best to do justice to the work of our professionals. I seek their forgiveness if I fell short. Burroughs Compared to the Others known as "The Fab 4 of Education"
See Her Last Political Action - Pittsburg Courier, 17 Sep 1960 - Relevant Today? Click here to see the Interview at The American Baptist College for the NHB's Luncheon on March 20, 2019. Listen to Burroughs' message about raising strong children, fighting structual discrimination, and seeking cooperation across racial lines to fight racism and build a just society, as stated in her 1923 article above in reading materials. On March 20, 2019, the American Baptist College (ABC) in Nashville, Tennessee sponsored a Nannie Helen Burroughs Luncheon. This event represented an understanding and appreciation of the contributions and importance of Nannie Helen Burroughs far beyond my expectations. First the first time in my eleven-year journey, I met a group of women who are committed to bringing the views and vision of this remarkable into the lives of our children. 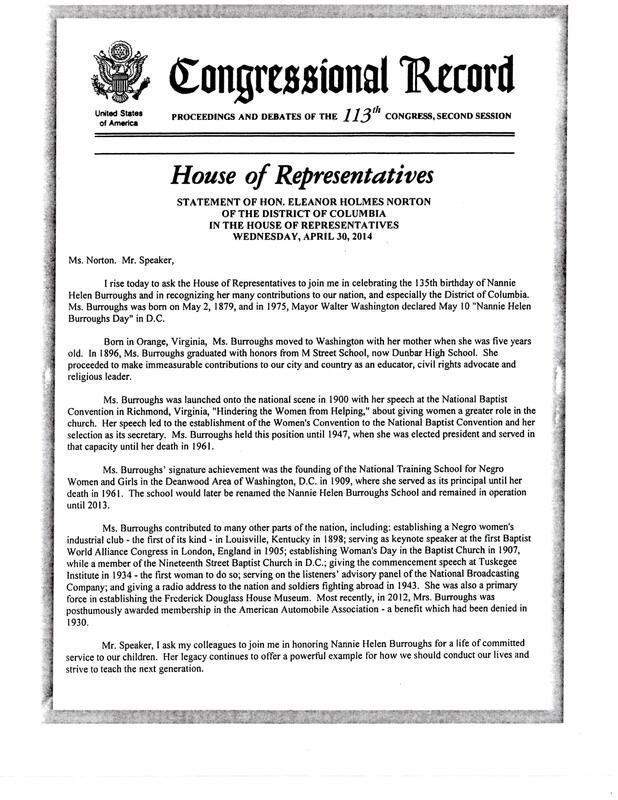 I applaud the leadership of ABC for inviting me to join in a relationship to advocate for Nannie Heln Burroughs, recognizing that Burroughs' views and those of the church have not always been consistent. I am convinced that Nannie helen Burroughs would highly pleased with the efforts by ABC. Stay tuned in! 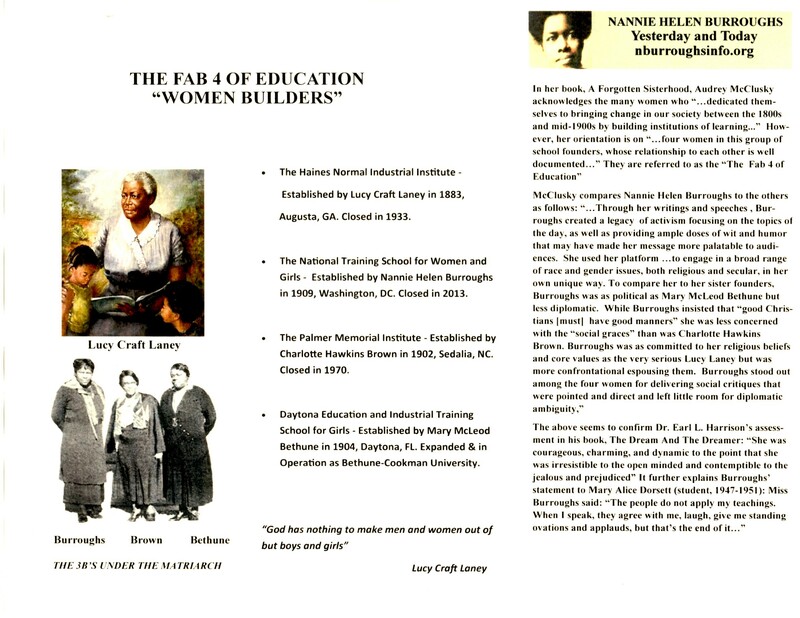 Click here to see the Nannie Helen Burroughs Day 2015 Program at the Washington, DC MLK Library. In September of 2017, Miss Burroughs' home church, the Nineteenth Street Baptist Church in Washington, DC, presented a play about two great women of the church, Etta Booker and Nannie Helen Burroughs. They were portrayed as special guests at a Sunday School setting, talking to the children about their lives and service. By all accounts, it was a tremendous success, being both entertaining and informative. This event represented an important step in bringing this remarkable woman's views back into our lives. Therefore, I applauded the 19th Street Baptist Church for what appeared to be the beginning of their recognizing the important contributions of Burroughs to the church, our race, and country. However, the cooperation expected has not materialized. On May 19, 2018 we held a "Wreath-Laying Ceremony" at Lincoln Memorial Cemetery representing the 57th Anniversary of Miss Burroughs demise. 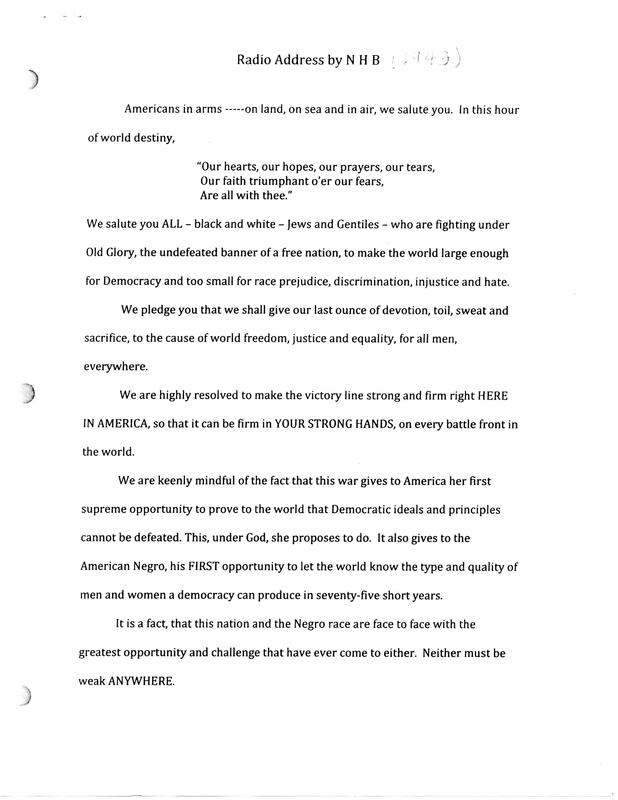 The leaders of our Black Baptist Conventions were requested to send letters of tribute. There were no responses. The project has been funded since 2010 with my personal resources. I have now established a nonprofit and plan to seek grant funds to support the effort. 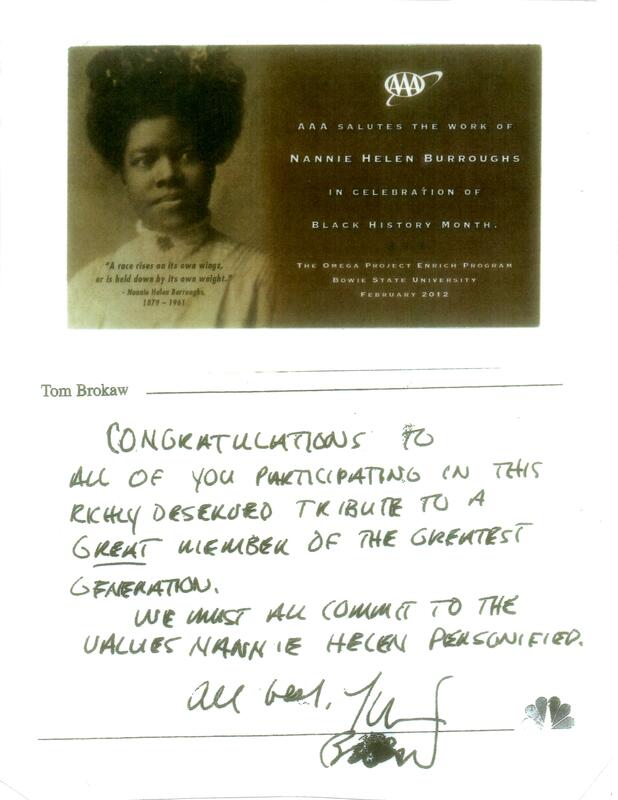 After ten years of advocating for the views and vision of Nannie Helen Burroughs, I have concluded that the best chance for establishing her legacy discussing her views and vision rests with our young people. Therefore, while I continue to pursue an open and honest discussion in our Black community about Miss Burroughs, my grant pursuit, not yet underway, will be to explore ways to bring a discussion of her life and works to HBCUs across the country. Closing Statement: I believe Nannie Helen Burroughs' Crusade To Improve American Life on all Fronts sent an important message and provided guidance as to how we might at least consider dealing with our problems today. She acknowledged that changes in race relations were incremental and temporary, always recognizing that any remaining structural racial issues must always to be addressed. At the same time, she seemed to suggest that personal behavior and attitudes must be constantly addressed in the Home, Church, and School. 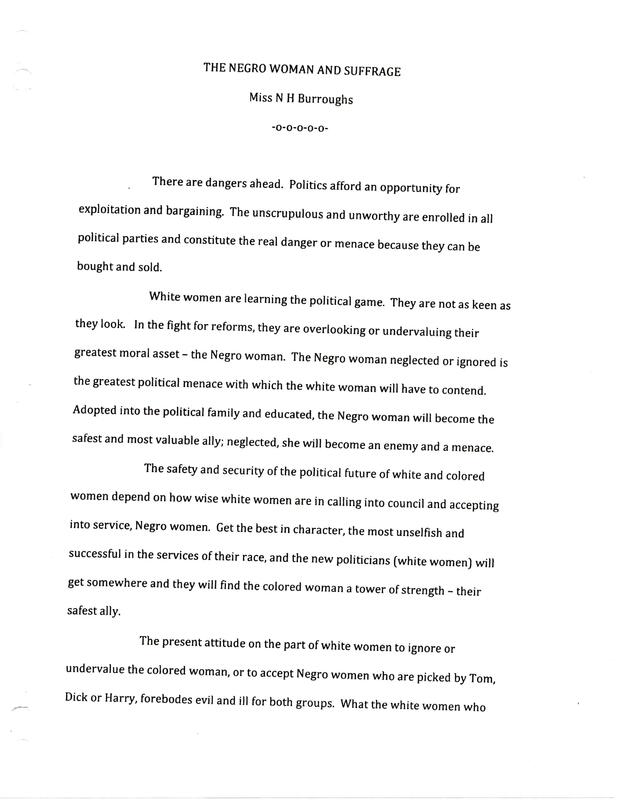 While we need to use Burroughs' views and vision today as the basis for a discussion across our country, I believe we first need a discussion among ourselves in the Black community. Remember, Burroughs fought the structural racial problems in our country while seeking cooperation wherever she could find it. Cooperation was so important to her that she dedicated a chapter in her books, What Do You Think?/Think On These Things, 1950/1952, to The Meaning of Cooperation. She also acknowledged that we had differences within our race that required equal attention. The bottom line is Nannie Helen Burroughs fought for progress and justice on all fronts. Let's use the knowledge she left us to fight our battles of today. Our Problem - Burroughs' Solution: Our country's current political problems seem to foster more racial animosity than I have seen in decades since we began breaking down structural racial barriers. The instant case is how we have allowed Russian political intervention to play on our internal racial differences. Should we not, as a nation, be against Russia's interference and fight cooperatively to solve our internal problems? Is that not how we solve problems in our homes? I believe her solution would be for the two political parties to call a halt to the bitter fighting fostered by political ideology. Both should assume the worse case of the other's position, thus precluding the search for guilt and retribution. As such, the parties could concentrate on cooperatively solving whatever those assumed worse cases present for the good of our country, ensuring they never happen again. The question, however, may be: Can the unscrupulous and unworthy in both parties (Burroughs in 1923) rise to the occasion, while our ministers (Burroughs in 1920) "...are preaching too much Heaven and too little Practical Christian Living..."
Epilogue: This is not the end, just a point along the way. In reference to Our Problem, one investigation has ended, while being extended by one political party, as another investigation is being started by the other party. The path of "common ground and cooperation" advocated by Nannie Helen Burroughs was not met. The embrace and cooperation of the American Baptist College with the Nannie Helen Burroughs Project gives new life to Nannie being to say one day, a true Epilog: "The people applied my teachings and they improved themselves economically, intellectually, politically, and socially, and that made them first-class citizens"
"I Have Fought A Good Fight; I Have Finished My Course"
White Woman's Final Tribute, 1964: Nannie Helen Burroughs influence over her people can hardly be estimated. She had dynamic power. Measured not as a woman, she had extraordinary ability and her living faith in God and in her children, of whatever race, her spirit of services and sacrifice energized her gifts as only faith and love can do." God grant that she will not have lived and toiled in vain. 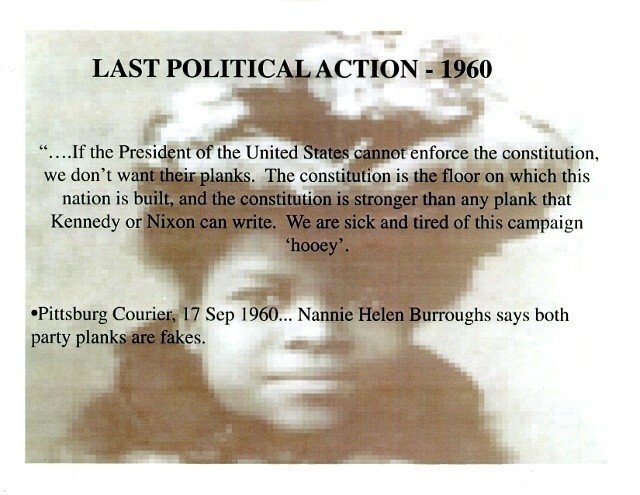 Nannie Helen Burroughs transitioned on May 20, 1961, at the age of eighty-two. Her Home Going Service was held on May 25, 1961, at her church, the Nineteenth Street Baptist Church, now on Sixteenth Street in Washington, DC. Dr. William Holmes Borders, Pastor of Atlanta's Wheat Street Baptist Church and Morehouse College Professor of Religion, showed his admiration for the life and works of Nannie Helen Burroughs in his 1943 poem: "I Am Somebody---I am a moulder of Character in Nannie Burroughs" He recites the poem in a musical setting, with commentary about our history and education: Google Dr. William Holmes Borders , I Am Somebody UTube. Contact us today in Annapolis, Maryland, for details about this icon of African American history.